Ricotta is an Italian sheep milk or cow milk whey cheese. Ricotta, lit. 'recooked', uses the whey, a limpid, low-fat, nutritious liquid that is a by-product of cheese production. 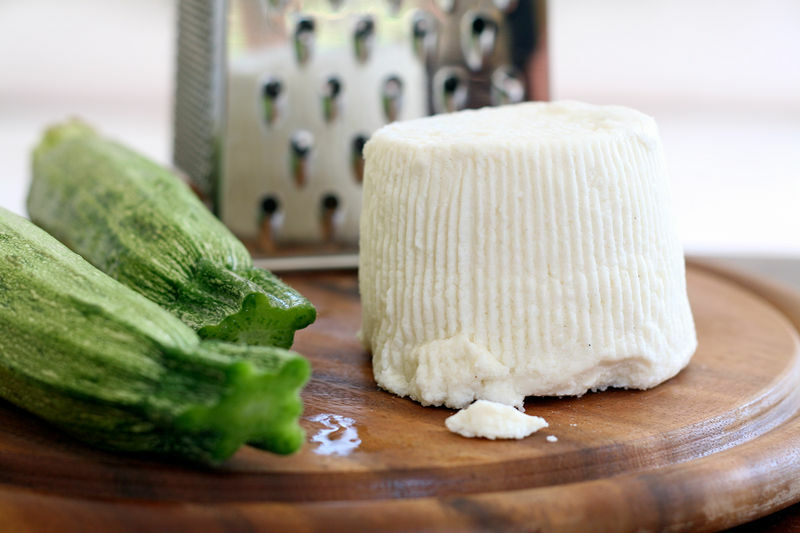 Ricotta is produced from whey, the liquid separated out from the curds when cheese is made. Most of the milk protein (especially casein) is removed when cheese is made, but some protein remains in the whey, mostly albumin. This remaining protein can be harvested if the whey is first allowed to become more acidic by additional fermentation (by letting it sit for 12–24 hours at room temperature). Then the acidified whey is heated to near boiling. The combination of low pH and high temperature causes additional protein to precipitate out, forming a fine curd. 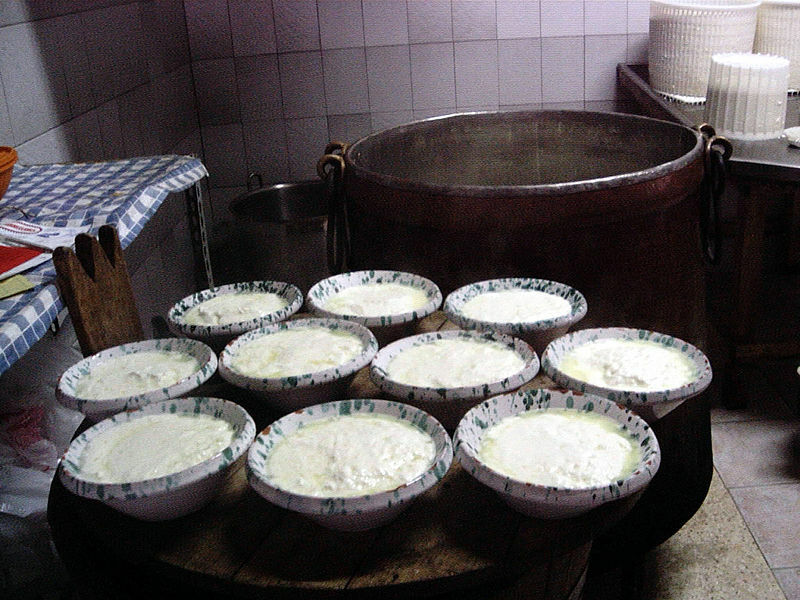 Once cooled, the curd is separated by passing though a fine cloth. This curd, after drainage, is ricotta. Because ricotta is made from whey, rather than milk, it is a whey cheese, not technically a "cheese". Ricotta is a fresh cheese (as opposed to ripened or aged), grainy and creamy white in appearance, slightly sweet in taste, and contains around 13% fat. In this form, it is somewhat similar in texture to some cottage cheese variants, though considerably lighter. Like many fresh cheeses, it is highly perishable. Like mascarpone in northern-Italian cuisine, ricotta is a favorite component of many Italian dishes, such as cheesecakes and cannoli. There are also kinds of cookies that include ricotta as an ingredient. In Italian households and dining establishments, ricotta is often beaten smooth and mixed with condiments, such as sugar, cinnamon, orange flower water and occasionally chocolate shavings, and served as a dessert. This basic combination (often with additions such as citrus and pistachios) also features prominently as the filling of the crunchy tubular shell of the Sicilian cannoli, and layered with slices of cake in Palermo's cassata. Ricotta may also be used in savory dishes, including pasta, calzone, pizza, manicotti (pre-shaped pasta tubes stuffed with a filling), lasagne, and ravioli.